Safe water, sustainable chemicals, and a clean environment — for all. Microvi was founded to make a positive impact on the world through a paradigm-shift in science and engineering. We first used our proprietary platform technology, MicroNiche Engineering™ (MNE), to provide safe and low-cost drinking water for disadvantaged communities. Today, our solutions save lives, improve health and provide affordable drinking water while preserving our environment. Following the success of our drinking water solutions, we focused on additional areas where we could help solve the world’s most pressing problems. We applied our MNE platform for the massive nutrient removal challenges facing the wastewater industry. Our breakthroughs include a new class of technologies to cost-effectively remove various pollutants such as ammonia, phosphorus and nitrate with proven applications across the municipal and industrial wastewater sectors. In parallel to our work developing disruptive technologies for wastewater, we also focused on turning low-cost, renewably sourced carbon (gaseous and liquid) to produce chemicals and fuels. These efforts resulted in unprecedented yields, titers, and productivities for major chemicals that will help decrease petroleum dependency and reduce greenhouse gas emissions. All of our products and technologies keep people and the environment in mind while utilizing our powerful MNE™ platform technology to help meet the world’s needs. Today, Microvi is one of the leading green technology companies in the world. We deliver solutions that disrupt markets for our partners, drive customer value and help make our planet more sustainable and equitable for future generations. 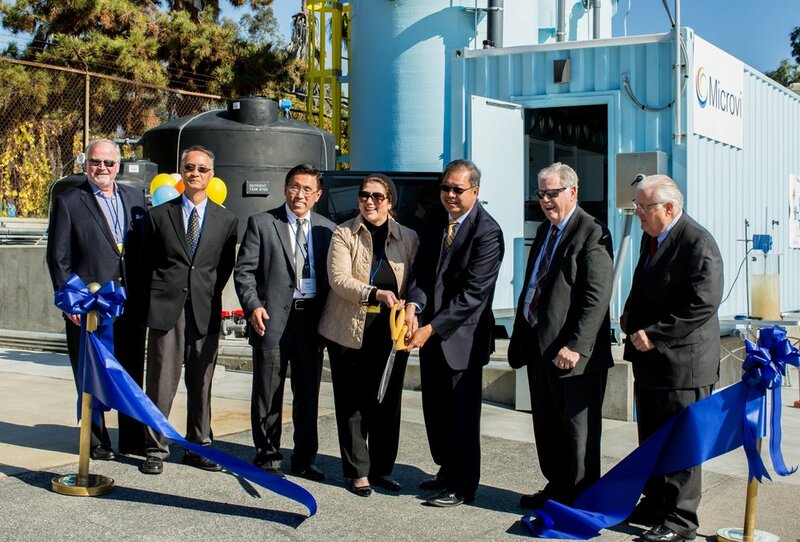 The grand opening ceremony for Microvi's nitrate-removal plant for drinking water at Sunny Slope Water Company in Pasadena, California.